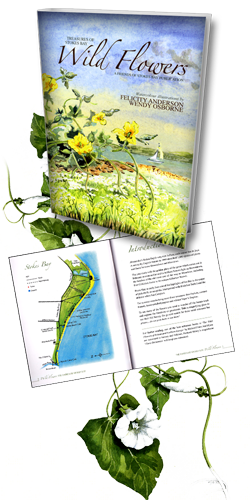 In collaboration with two local artists the Society has published this charming booklet to celebrate the rich flora of Stokes Bay. A total of 34 flowers are illustrated in full colour together with a mine of information about how to identify them, where and when to find them and fascinating facts about their folklore. 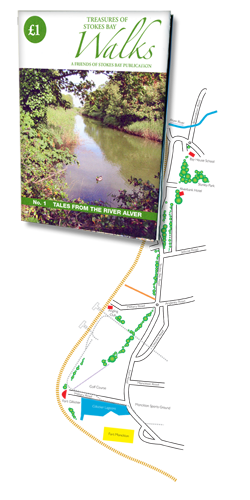 For centuries all the land south of Alverstoke village was a marsh, saturated by the River Alver which flowed from the west near Browndown, parallel to the shore until it entered the sea at Gilkicker Point. Over the years attempts to drain the marsh led to the river following a more constrained course until eventually, in 1857 it was diverted into a complex system of moats which were used to defend the five batteries that were built on Stokes Bay as part of the western defences of Portsmouth Naval base. This walk follows the River Alver from the western end of Stokes Bay to Gilkicker Point in the east. The leaflet provides a map and a timed route punctuated by points of interest. Walk the whole route or follow it in manageable chunks to suit your time and ability and along the way you will discover fascinating secrets about the history of Stokes Bay. Although about one third of the UK coastline is shingle, few areas are stable enough to support vegetation. Stokes Bay and Browndown are rare examples of the latter and because the habitat is so uncommon and rare, endangered species of flora and fauna can be found here. For this reason, Browndown and the lagoons at Gilkicker are designated as SSSIs (Sites of Special Scientific Interest). Over the years the shingle shore has seen royalty, pleasure craft, railways, military activity, construction yards, piers and training establishments with many leaving tell-tale clues behind. This walk follows the shingle shore from the western end of Stokes Bay to Gilkicker Point in the east. The leaflet provides a map and a timed route punctuated by points of interest. 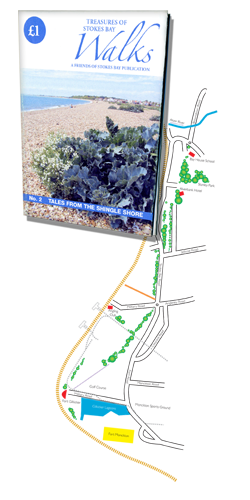 Walk the whole route or follow it in manageable chunks to suit your time and ability and along the way you will discover some interesting clues plus informative and entertaining tales about Stokes Bay. This publication describes in absorbing detail the defences from the earliest (in 1545) to the present day. Fully illustrated throughout, all five batteries are described in detail including their development, use and armaments. 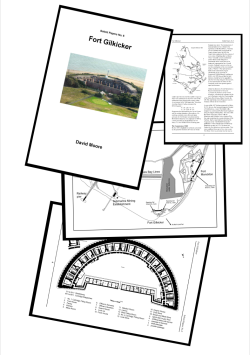 Crammed with interesting facts, and supported by a comprehensive glossary of military terminology, it is a gem of a publication and a must for anyone curious to discover the fascinating strategic history of Stokes Bay. This publication describes in detail the history of the fortifications at Gilkicker Point from the earliest, Haselworth Castle (first mentioned in 1545) to the present day fortification which was constructed in 1863. Fully illustrated throughout, the fort is described in detail including its development, use and armaments. Crammed with interesting facts, and supported by a comprehensive glossary of military terminology, it is a gem of a publication and a must for anyone curious to discover the fascinating strategic history of StokesBay. 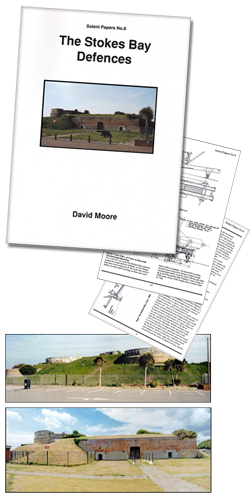 This publication describes in detail the three defensive fortifications built in the 1860’s in the Solent to protect Portsmouth Dockyard. They were fabricated on Stokes Bay and then transported out to their sites to be constructed. Fully illustrated throughout, the three forts are described in detail including their development, use and armaments.